commitment to best practice in sustainability and adds to our list of achievements. CSU Green is excited to support new Environmental Sustainability grants through the universities Community University Partnership or "CUP" grants program opening Monday March 11 2019. "These grants are available to community groups, working in the footprints of the six main Charles Sturt University campus areas" said CSU Green manager Ed Maher "CSU and CSU green regognises and is thrilled to support the important work and contribution local groups make towards environmental sustainability in our regions"
Grants of up to $2,000 per group (funding pool of $10,000 for environmental sustainability grants) will be open for applications from eligible groups until April 7 2019. For more information and how to apply for these grants please see the Community University Partnership page and select the Environmental Sustainability theme. Deer numbers in Northeast Victoria have exploded in recent years as humans and deer compete for space and resources in the region. Charles Sturt University (CSU) researcher, Dr Jennifer Bond, says conflict issues include road safety, environmental degradation, and loss of productivity on private land. Students moving out of Wagga Wagga campus residences have again sorted unwanted food for donation with the support of the student Sustainability Advisor, Sophie Kingston who assisted students to sort their unwanted belongings as they moved away from university. 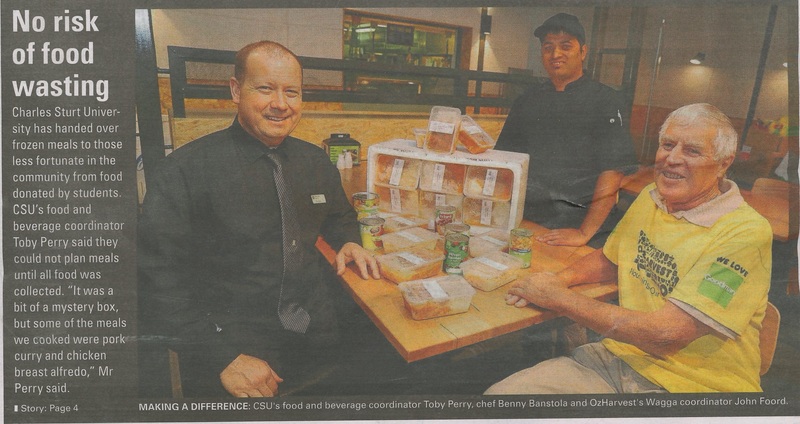 This has resulted in 503 meals being made from perishable food waste and donated to OzHarvest in Wagga for distribution to local people experiencing hardship. Thanks to Toby, Sophie and everyone involved in a great effort to make this happen and ensure that this food doesn't get wasted. 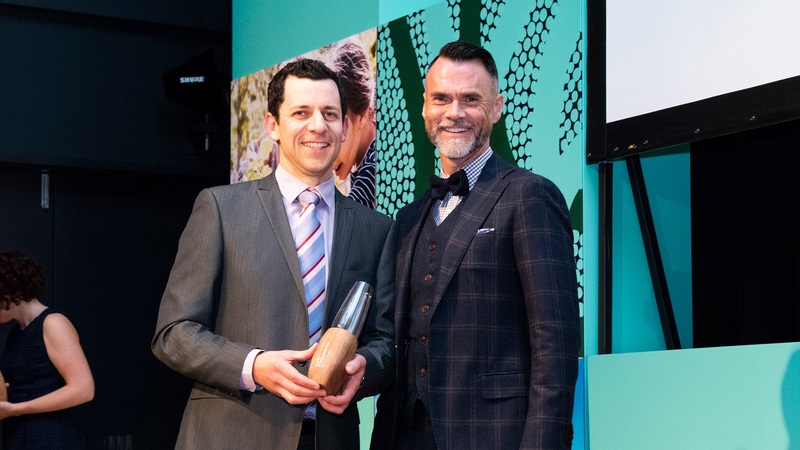 CSU Green manager Ed Maher was jointly awarded the 2018 Sustainability Champion Award for his work delivering environmental programs that led to CSU becoming Australia's first certified carbon neutral university. Ed said receiving the award was a great honour, particularly because the reputation of the award was synonymous for achieving good sustainable outcomes. 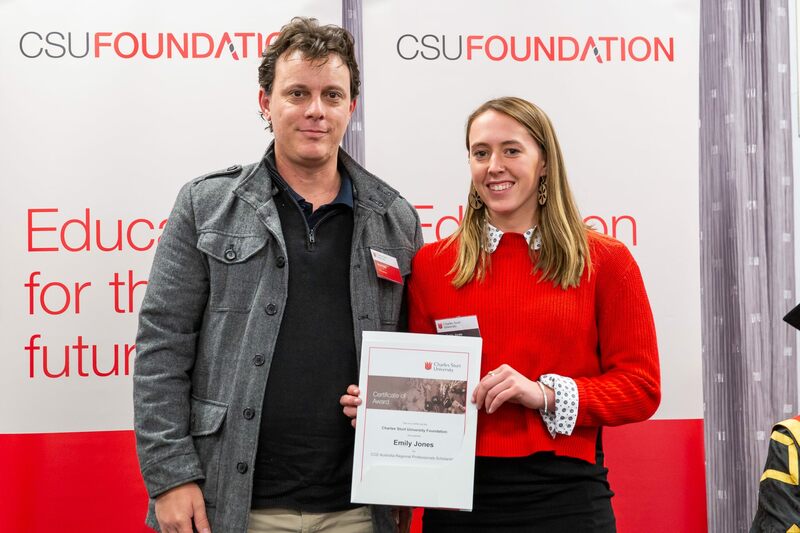 “The recognition reflects Charles Sturt University’s commitment to and importance placed on sustainability as being part of how it does business" he said. The awards have been held since 2012, so they come with a level of prestige and recognition among business, industry, not-for-profit and government sectors. The Green Globes are awarded by the NSW Office of Heritage and Environment at a ceremony held in Sydney on the 4th October 2018. Charles Sturt University (CSU) is going ‘Straw No More’ by abandoning the use of plastic straws at all its catering outlets from Monday 8 October. CSU Food and Beverage manager Mr Brett Russell (pictured, with the 'last plastic straw') said, “Plastic straws are an issue in the environment, as they contribute to littering across our campuses and the wider community. “They are particularly problematic if they enter waterways where they can cause significant harm to wildlife. 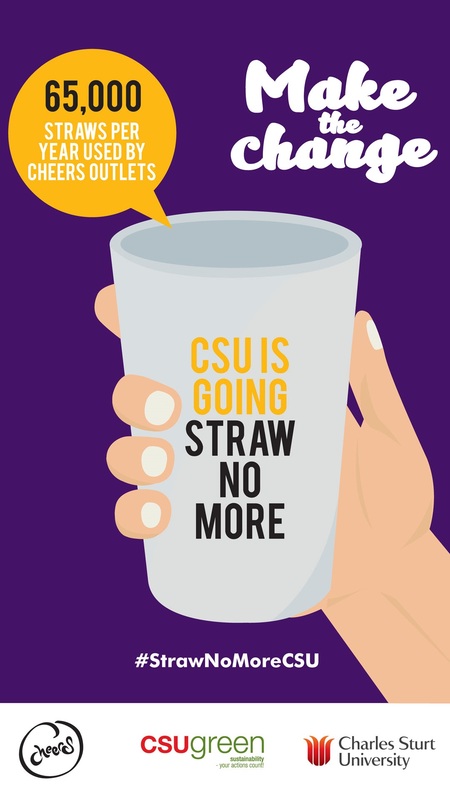 Mr Russell said CSU’s adoption of the Straw No More initiative follows the success of the University’s ‘War on Waste’ campaign to reduce the number of disposable coffee cups sold across its campus food outlets (CHEERS) by over 50 per cent since August 2017. Charles Sturt University (CSU) has begun the installation of solar panels that will provide the University with over 2,500 kW of renewable energy across its Albury, Bathurst, Dubbo and Orange campuses. The installation will add to the existing 1700kW solar energy generation at CSU in Wagga Wagga; one of Australia’s largest solar rooftop projects on a single site. The original Stage 1 project partner, NSW company Todae Solar, was also successful in being awarded the second stage. CSU Green manager Ed Maher said on-site renewable energy generation is a critical part of the University’s aspirations to source all of its energy needs from renewable sources. “The University’s staff and students and the community welcomed the first phase, and the University is looking forward to providing its campuses at Dubbo, Albury, Orange and Bathurst with the significant benefits that this clean energy brings,” Mr Maher said, and added the project will create jobs for local firms. This expansion provides nearly $6 million in savings over a conventional power plan so it brings triple bottom line benefits to the campuses and the University as a whole. Over 7,100 panels will cover over 50 buildings saving over 3,000 tonnes of CO2 emissions every year over the life of the project compared to emissions-intensive conventional energy. The annual energy generated is equivalent to that used by around 580 family homes. Regional Australia benefits too with local clean energy jobs, reduced energy costs, a cleaner environment due to significant emission reductions, and a stronger grid. 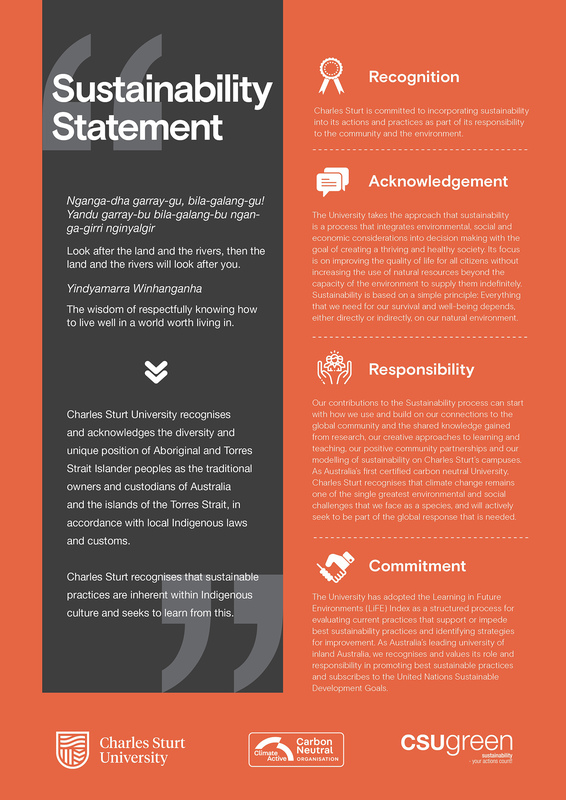 Charles Sturt University (CSU) has released the 2017 Sustainability Scorecard which details activities and achievements that contribute to CSU cementing its commitment to environmental sustainability and building upon being ‘Australia’s first Carbon Neutral University’. 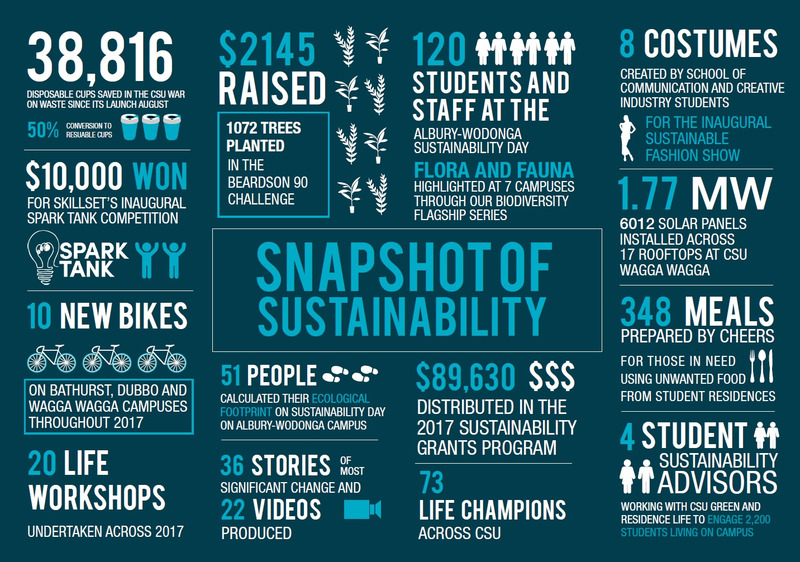 Manager of CSU Green Mr Ed Maher said, “The 2017 Sustainability Scorecard highlights many exciting developments towards best practice in sustainability for Charles Sturt University. 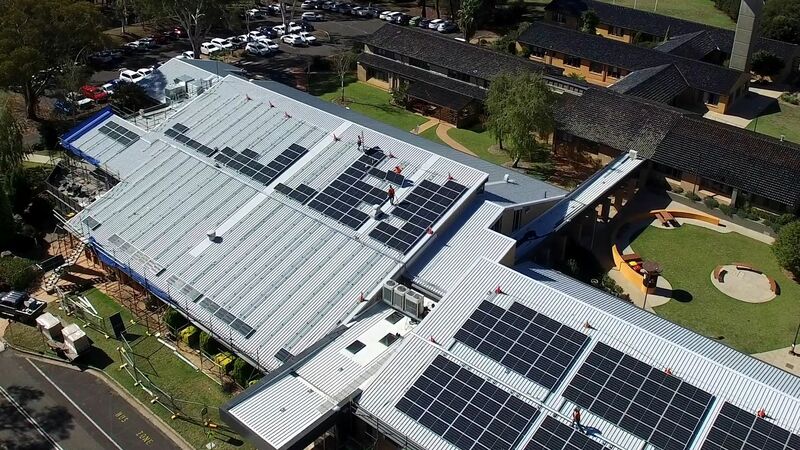 “One of the most visible examples was the completion of our 1.77 megawatt solar installation at the University in Wagga Wagga, which remains one of Australia’s largest roof-mounted photovoltaic (PV) systems,” he said.